I just threw together this amazing salad before the first hard frost. 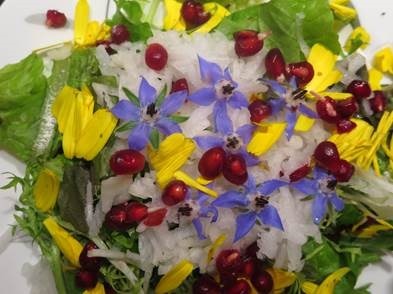 Check it out; mixed garden greens, shredded daikon radish, calendula flower petals and borage flowers (this beautiful little flower is my logo). All the above came right out of my garden. I added a handful of pomegranate seeds, a twist of sea salt and some organic olive oil. Mixed greens like mustard, arugula, endive, romaine, chard and butter crunch are all easy to grow. Also, daikon radish, borage and calendula grow readily in most climates. I encourage you to begin planning your garden for next year at the end of January. You can begin plant starts indoors late February or early March. As soon as risk of a hard frost is over you are ready to plant your starts outside in a small garden bed. This white root vegetable is known as a super food due to its many health benefits. 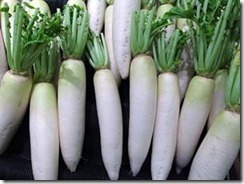 Daikon radish is very low calorie, about 6 calories per ounce, but is packed with nutrients. It contains large amounts of enzymes that aid in fat and starch digestion as well as high levels of vitamin C, phosphorus and potassium. It also contains other phyto-nutrients that fight cancer. The green leaves are even edible and high in nutrients. Add the green tops to your salad mix, soup or stir fry. See the picture below of this white root vegetable. You don’t have to wait for your first crop next spring. 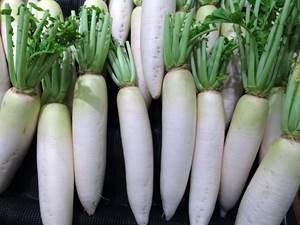 I just saw several booths selling daikon radish at the farmer’s market and found it at the grocery store today. I hope you will give this super food a try. Send me a comment and let me know how you prepared it and what you think! I like it raw and added to stir fry. In addition to the grated daikon radish in my salad today I made some thin slices for scooping up hummus.